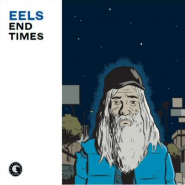 Eels, led by E (known to some as Mark Oliv­er Everett), pro­duced its eighth LP, which released on the 19th. End Times focus­es its lens on the depress­ing top­ic of divorce, along with oth­er top­ics of sim­i­lar nature, per­formed to often upbeat, gen­er­al­ly major melodies and tunes. This odd com­bi­na­tion of sounds, lyrics, and vocal stylings leads End Times to be, for the most part, an unsuc­cess­ful, though cer­tain­ly not mer­it­less release. It can hard­ly be said that E’s vocals dance over the del­i­cate­ly con­struct­ed instru­men­tals. His hoarse, raspy voice bare­ly begins to exite the lis­ten­er on “Par­adise Blues,” eas­i­ly the most active track; E’s lit­er­al­ly screamed “woo!” may be loud, but it’s still grat­ing. The vocals reach what is eas­i­ly their worst point on End Times dur­ing “A Line in the Dirt,” with the frankly hor­ri­ble falset­to. While the vocal style might fit well with the theme of the album, it def­i­nite­ly doesn’t help con­vince the lis­ten­er that what E is singing about should be con­sid­ered emo­tion­al­ly com­pelling. End Times is effec­tive­ly an album of E pin­ing at length over an ex-wife, although he also wres­tles with such prob­lems as ‘going out­side.’ The word­ing itself is painful­ly direct. The best imagery that can be mus­tered is along the lines of “She used to love me but it’s over now. / That was a good thing that’s gone and gone” (of “Gone Man”). E’s only major attempt at a metaphor is in the dia­logue of “Apple Trees,” in which he declares, both melo­dra­mat­i­cal­ly and extreme­ly uncom­pelling­ly, that he feels like one apple tree among thou­sands and thou­sands. Through­out the album he con­sid­ers the divorce, attempts to make up, and gen­er­al­ly goes through the stereo­typ­i­cal, here dul­ly-por­trayed emo­tions of some­one work­ing through a gener­ic tragedy. What is then extreme­ly dis­con­cert­ing are the mul­ti­ple upbeat, major, not quite jol­ly but cer­tain­ly some­what cheery tracks. It is some­what aston­ish­ing that a band as expe­ri­enced as Eels would not think twice about singing the lines: “well it’s a pret­ty bad place out­side this door. / I could go out there but I don’t see what for” to a nice, airy set of instru­men­tals, and lat­er insert the mer­ri­ly sung (and falset­to) “na na na na…” yet this is just what “Man­sions of Los Feliz” is. As a whole, End Times is just not a good album. There are cer­tain good ele­ments (the instru­men­tals), but the vocals are styl­ized poor­ly and are uncom­pelling in their telling of the gen­er­al­ly abysmal lyrics. There are cer­tain­ly some ter­rif­ic sec­tions on the album, for exam­ple, “Unhinged” dur­ing the first entrance of the organ and vocals, at that point about as good as they ever are on End Times. How­ev­er, the inter­lude tracks “Apple Trees” and “High and Lone­some” are noth­ing if not unnec­es­sary. For what its worth, End Times cer­tain­ly feels like a good album dis­fig­ured by a num­ber of flaws, not a fun­da­men­tal­ly bad album, but that is not enough to sig­nif­i­cant­ly sal­vage its score.